Photography as an art form has always had to fight for itself. During the second half of the last century, it had to battle its way into museums. Today, in a world flooded with cell phone images and debates over who owns the rights to images posted online, photography as an art form is again under fire. Joan Fontcuberta puts all this into perspective in his inkjet print, “Googlegram: Niepce,” on view in the Princeton University Art Museum’s Itinerant Languages of Photography exhibition through Jan. 19. 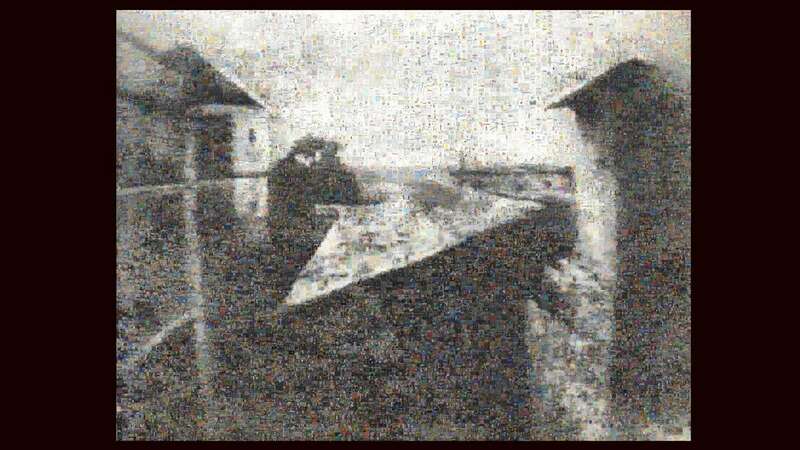 Meditating on the itinerancy of images, Barcelona-born Fontcuberta started by Googling the words “photo” and “foto.” He processed 10 thousand results through photomosaic software to re-create the earliest known photograph, “View from the Window at Le Gras,” circa 1826 by Joseph Nicephore Niepce. That image shows a person looking out from a rooftop in a French city. Fontcuberta creates the larger image by making a grid of the tiny postage stamp size images from Google, forming lights and darks to give shape to the larger image – as a halftone would do, and as the artist Chuck Close has perfected. From a distance we can see the original black-and-white image on the rooftop, but the closer we get, the more we see the bits it’s made up of. Up close we’re fascinated by tiny little pictures of everything from faces and a map to advertisements. The works brings together the past, present and future of the medium. Like postcards, photographs are moving signs that travel from one context to another, according to exhibition text. They move from the intimacy of the family album into museums and galleries, they travel in print and in digital form. As they circulate, they redefine themselves in each new context. Guest curated by Eduardo Cadava, professor of English, and Gabriela Mouzeilles, Professor and Chair, Department of Spanish and Portuguese Languages and Culture, the works on view come from Latin American and Catalonian photographic archives and are organized into four sections: Itinerant Photographs, Itinerant Revolutions, Itinerant Subjects and Itinerant Archives. 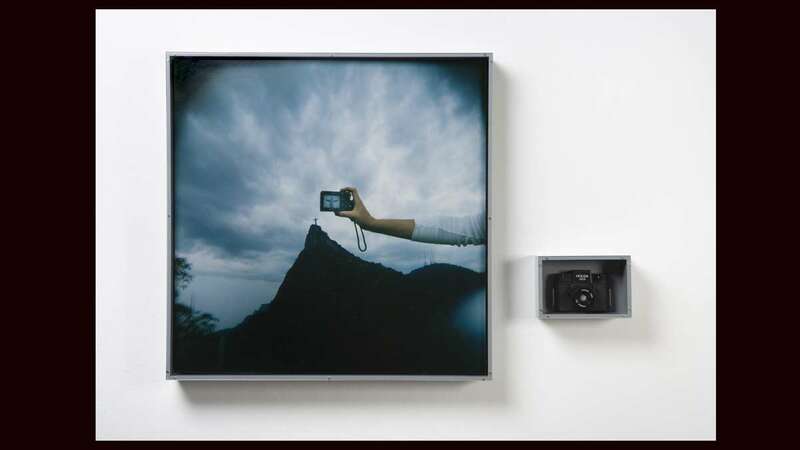 They suggest the future of the medium with Latin American photography at the forefront of new aesthetic possibilities. “To collect photographs is to collect the world.” Susan Sontag is quoted on the wall. There is a collection of Brazilian photographs that document scientific advances and the process of modernization. Although these depict Brazil, they also show the transnational history of early photography – some of these photographs came to Rio de Janeiro from Europe, Africa and North America. One albumen print from 1973 shows a human cast of a pregnant woman, a result of the volcanic eruption that destroyed Pompeii in 79 A.D. This is described as an image of a “biological camera” — the woman who is duplicating herself through pregnancy is in turn duplicated by the volcanic lava that makes a copy of her dead body, which is then recorded by Michele Amodio’s camera. “The allegorical picture suggests that photography may be a means of overcoming death through the creation of images,” say the curators. This is a major exhibition, taking up two large galleries, with 90 works from Argentina, Brazil, Mexico, Spain and the U.S. There is a substantial catalogue and lots of exhibition text to sink your teeth into. Plan to spend a good amount of time absorbing it. We read that the Mexican Revolution (1910-1920) ignited an explosion of photographic images coinciding with the emergence of photography as a popular medium, a photographic revolution, if you will. Portable cameras could show soldiers, crowds and casualties in newspapers in the U.S. and Europe. The images were further appropriated and re-interpreted through cropping, editing and captioning, and many images acquired new meanings along the way. This sparked the Modernist Revolution. Renowned Mexican and foreign art photographers – among them Lola and Manual Alvarez Bravo, Henri Cartier-Bresson, Tina Modotti and Paul Strand – turned to experimentation and the surreal as they sought to transform the medium itself. Contemporary photographer Graciela Iturbide’s image of birds swarming a utility pole shows the similarity between the utility pole and a cross. Wires sprout upward like rays of divine light. The flight of the birds evokes the passing of life. “It’s as if the country’s religious energy is being redirected toward the project of national modernization,” says the label. As the camera wanders, so do its subjects – street walkers, migrants, illegal border crossers. The section Itinerant Subjects includes some of Spain’s most powerful street photographers, who use the lens as a political instrument to show the impact of urban modernization. 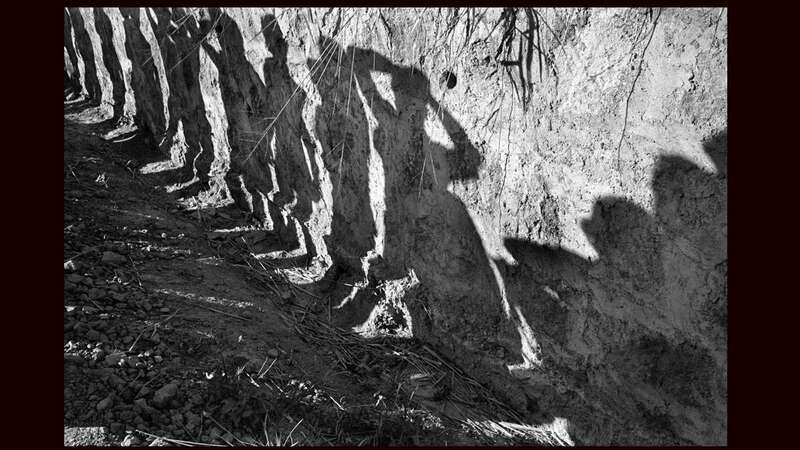 We see shadows, silhouettes and tracings of children, protestors, assassinated leaders, gang members, soldiers, death squads. “The illiteracy of the future will be ignorance not of reading or writing but of photography” – this quote is attributed to photographer Laszlo Moholy-Nagy. The Artful Blogger is written by Ilene Dube and offers a look inside the art world of the greater Princeton area. 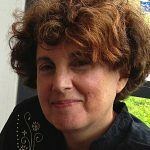 Ilene Dube is an award-winning arts writer and editor, as well as an artist, curator and activist for the arts.